We’ve always argued that high-quality, targeted content is king when it comes to selling on Amazon–and now we have another piece of evidence to back it up. 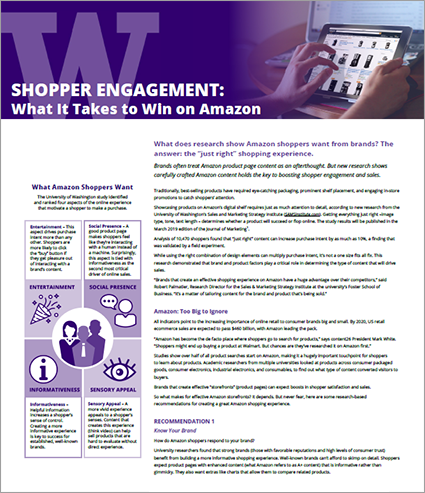 New research published in the Journal of Marketing finds that carefully crafted Amazon product page content holds the key to boosting shopper engagement and sales–so long as it’s carefully tailored to suit your product and your shoppers’ expectations. An analysis of 10,470 shoppers found that improving just one element of the Amazon product page can increase purchase intent by as much as 10%. In addition, the Amazon content study found that when multiple elements were added to a product page, Amazon sales more than doubled during a two-month field testing period.